Processes, equipment, robotics, data collection. Triton Innovation Inc. is a machine builder/systems integrator that is focused on saving clients money through improved processes and efficient equipment design. We focus on advanced data collection and analysis techniques built into the equipment to enable the end user to measure the equipment's efficiency over time and help to pinpoint bottlenecks in production. We have over 70 years of integration experience in house between designers, electricians, technicians and programmers. Everyone is concerned about safety. From the top floor to the shop floor, we all need to leave work safely. On top of that, rising WSIB/insurance costs make safety a top priority for everyone. At Triton Innovation, we use the best in safety controls to ensure that we produce safe equipment that is also highly productive. We accomplish this through the use of programmable safety controls that allow us to tightly control safety inputs and outputs without adding cost to the cell. Manufacturing has not changed for many years. Advancements in consumer electronics have not filtered into the industrial space. At Triton Innovation, we want to change manufacturing. We want to give you access to the data that is already in your machine, and we want to tie it into your existing systems (ERP, MRP, MES, etc.). We can install data collection from the smallest machine up to large, complex systems for a minimal investment, from basic machine running/uptime/efficiency information, right up to fully serialized and tracked production (license plating). Giving machines the power of sight enables more complex tasks to be performed. Triton has successfully implemented vision guided robotics, part quality/presence checks, verification (poke-yoke) stations, etc. using the latest in vision system technology. Integrated properly with a robot, it is a powerful tool. Collaborative Robots: Robots working in the same space as human workers. Triton Innovation Inc. is on the leading edge of collaborative robotics, having installed cells where an operator can safely work with a robot in the same space. We have done this on robots that are capable of moving 150kg (330lbs). A key advantage of collaborative robots is for large workpieces. For example, MIG welding a part with outside dimensions of 6' x 8' (1800mm x 2400mm) is possible with a large robot. It is costly both in floor space and equipment cost to mount a part that big to a turntable and index it around to a robot to be welded. On top of that, an operator will have a hard time loading parts to the back of the load-side table since they will be 6' away. Using collaborative robots, we can place a robot in the middle of two workpieces, and while an operator is loading one side, the robot can be welding on the other. The operator is also free to roam inside the cell to load components inside the robots traditional "safeguarded space." Under normal conditions, the robot will continue to weld while the operator is inside (the robot will not stop welding). If the system or robot detects an unsafe condition, all hazardous motion ceases until motion is re-initiated from outside the safeguarded space. Triton has been a pioneer in the fourth Industrial Revolution (Industry 4.0) before many knew what it was. 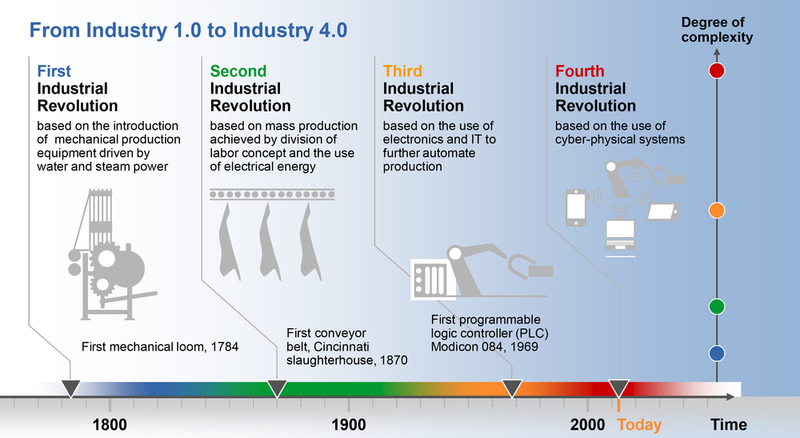 Industry 4.0 is the term used to describe the 4th revolution (disruptive, rapid change) in industrial technology. This revolution is characterized by the use of cyber-physical systems, which is a merger between physical equipment on the floor, and the virtual model of that same piece of equipment that exists in cyber-space. This can be as simple as a working, synchronized simulation of a robotic system, all the way to social machines and augmented operators. The end result of this merging of technology is shortening the cycle between design and launch of a product or machine, and simplifying changes to existing processes by fully understanding the consequences of an engineering change before a single bolt is turned. Triton has perfected offline CAD simulation systems that are linked and checked back to the real physical equipment. Any changes or new parts to be added to the system are programmed offline in the simulation, checked for interference and other issues, and then downloaded to the equipment. The only non-value added time used on the machine is for the first test cycle to ensure that the simulation is correct. The robot is essentially “self-taught”, as it takes what it is told should be the correct path, verifies that path on it’s own, and then proceeds to execute the program based on the real physical condition. The video linked below does a good job explaining the fundamentals of industry 4.0 by walking through the history of manufacturing, and showing a vision for the future.